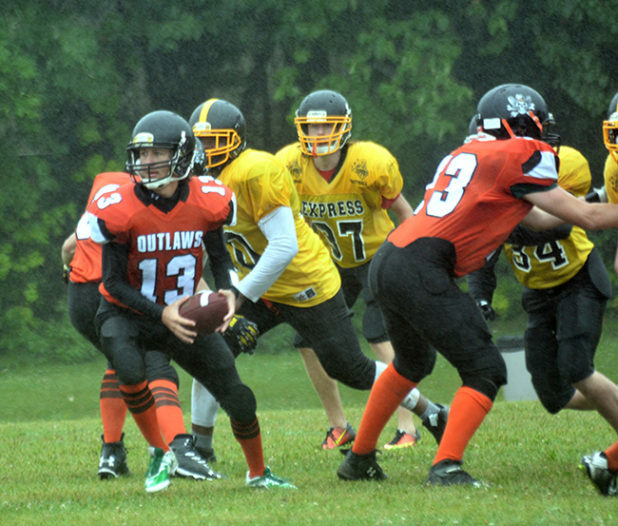 Since most of their games this season have been played out in some hot and sunny conditions, Sunday’s (July 22) Varsity game between the Orangeville Outlaws and the TNT Express didn’t foster a lot of complaints considering it rained for most of the game. While the fans on the sidelines may have been hunkered down underneath umbrellas and rain gear, the players put out a good effort in a game that would determine their final place in the League standings and also who they would play in the first round of the playoffs. Both teams came to the game with identical 7-1 records although the Outlaws were slotted into third place based on ‘points for’ during the season. Both teams scored in the first quarter but failed on convert attempts to make it a 6-6 game at the end of the quarter. The Outlaws produced some good defence in the second quarter holding the Express at mid field. A break-through TNT play saw the visitors score late in the half to take a six point lead. With just over three minutes remaining in the half the Outlaws recovered a fumble to take possession of the ball. They could not get out of the zone and the O-ville squad was forced to punt with just over two minutes left on the clock. It was again a tie game when the Outlaws scored early in the third quarter to make it a 12-12 game. The Outlaws took the lead with a two point safety. Late in the quarter, Outlaws quarterback, Luc St. Germain, threw a pass to receiver Barrett Mundell for a first down with 12 yards to go. Mundell scored on the next play to put the Outlaws ahead by eight points. The Outlaws wrapped up the game with a final TD and a 27-12 win. The win places the O-ville team in third place meaning they will face the North Bay Bull Dogs in the semi-final playoff game. With a 5-3 record the North Bay squad is a talented team, but if the Outlaws play a solid game they can come out top and earn a trip to the OPFL championship. The TNT Express will be facing the first place Beckwith Irish in their semi-final game. Beckwith is in first place with an undefeated record this season. Game dates for the semi-finals have not yet been announced.